France's victorious national team is returning home to a euphoric nation. 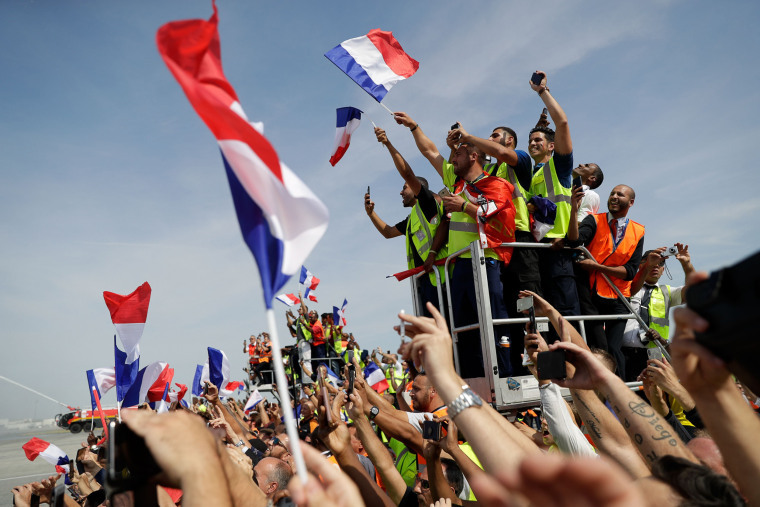 France's fans wave flags as they await the arrival of the team at the Roissy-Charles de Gaulle airport outside Paris on July 16. 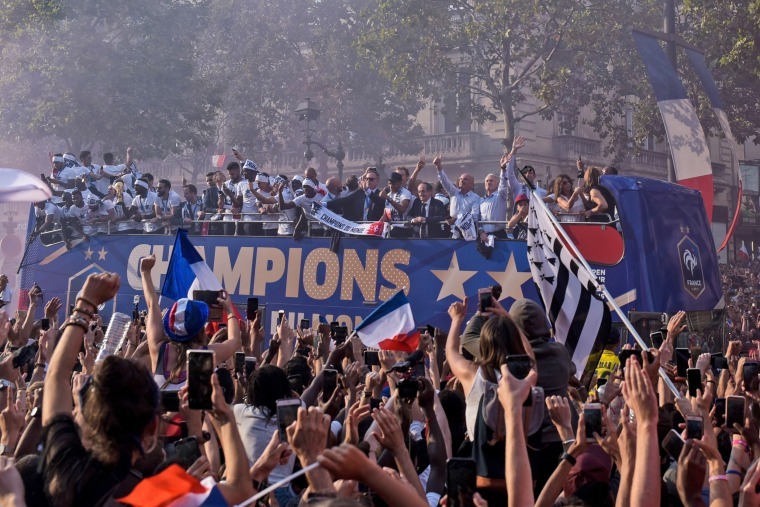 France was prepared to welcome home the national soccer team Monday for a victory lap down the grand Champs-Elysees, the grand Paris avenue where hundreds of thousands thronged after the team’s 4-2 victory Sunday over Croatia to capture the trophy. France's goalkeeper Hugo Lloris, flanked by France's forward Antoine Griezmann, left, and France's defender Raphael Varane, holds the World Cup trophy as the team arrives at the Roissy-Charles de Gaulle airport. France's players ride in an open-top bus down the Champs-Elysee. Fans celebrate Monday in front of the Arc de Triomphe. 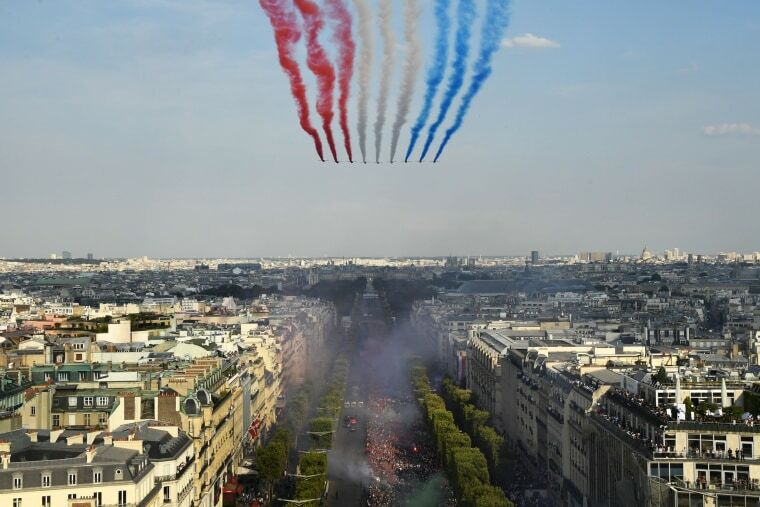 The Patrouille de France jets trail smoke in the colors of the national flag over the Champs-Elysee as supporters welcomed the team. 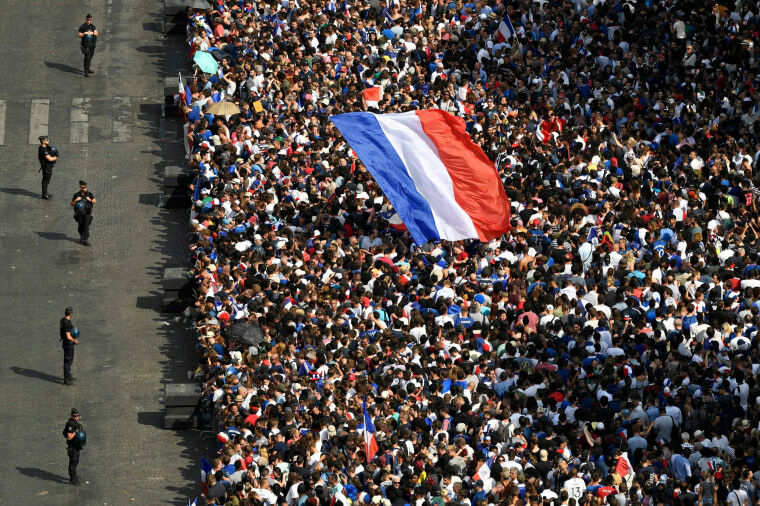 Supporters gather on the Champs-Elysees as they await the arrival of the French team. 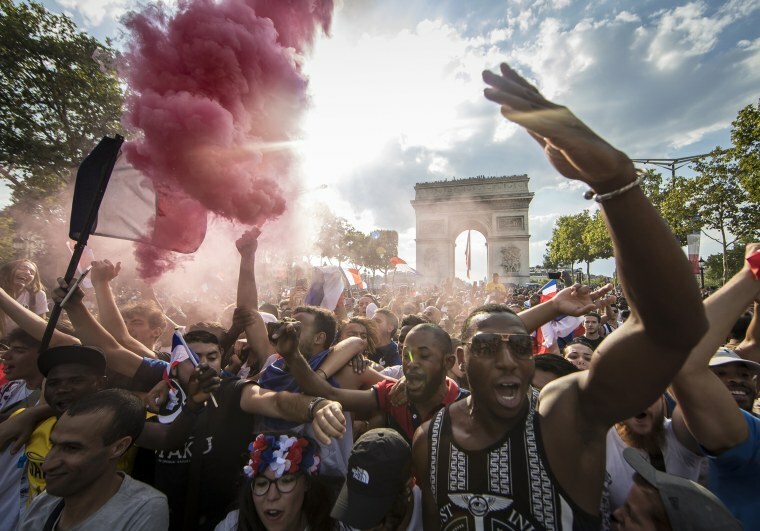 French supporters celebrate at the Arc de Triomphe in Paris on Sunday. The Eiffel Tower is illuminated in France's national colors. Two stars also adorn the monument to denote France’s second World Cup victory. The first was in 1998. Fans celebrate in the "Le Carillon" bar in Paris. Dogs are dressed in the colors of the French national flag in Marseille, France. A fan in a beret embraces another in Paris' Latin Quarter. A man crowd surfs at the "Le Carillon" bar in Paris, the site of one of the terrorist attacks in November 2015. France supporters climb a statue in Montpellier, southern France. France fans drive down the Champs-Elysees in a Renault painted in the colors of the French flag. Fans wave flags from a Paris rooftop. A fan looks out over the Champs-Elysees on Sunday. An image of France's Antoine Griezmann is projected onto the Arc de Triomphe. French gendarmes stand next to a man who was injured in a clash on the Champs-Elysees. Fans celebrate with flares in front of the Arc de Triomphe. A man falls to the ground after inhaling tear gas as fans clashed with police Sunday night following celebrations around the Arc de Triomphe. Fans clash with police on the Champs-Elysees. Broken shop windows and other destruction lined a section of the Champs-Elysees, the postgame site for revelers. Riot police used water cannon and tear gas to end the violence. Fans celebrate on the Place de la Republique.